On January 23, 2006, I tried to get myself elected as a Christian Heritage Party candidate for the Louis-Hébert riding in Canada. What follows are almost 100% of the adventures I had, leading up to 0.2% of the votes. On my first visit to the local Elections Canada Returning Office, I was handed the necessary documents to apply as a candidate. I also learnt that voting had already begun! "But, shouldn't Elections Canada open the voting polls only after the list of candidates is established?" Shrugged shoulders by the Returning Officer, zoom in on the big beady eyes of Mr. Bean! I needed 100 signatures supporting my candidacy. "Easy! I'm the only pro-life and pro-family candidate in this riding, so all Catholics will be stepping over each other to support me!" So I called the local Opus Dei Center, and proudly announced my existence. "Great! I'll sign!" said the Director. "Could I leave the signing sheet at the entrance, so all others could sign? ", I suggested. No, that would be a political activity, and we don't do political activities at the Opus Dei. OK, so can you send an e-mail to all Opus Dei members, to tell them I exist and where to reach me? No, for the same reasons. After much haggling, the best I got was "If a bus filled with members of the Opus Dei breaks down on the highway, and I just happen to come along, I could stop to help them, and mention I'm a pro-life candidate, then I could get their signatures?". Correct, except we never all travel in the same bus. Another zoom on my beady eyes. After this, I contacted a nun (a real old-fashioned religious nun, with a veil on her head, a cross around her neck, and true Catholic Faith in her heart). She was ecstatic at the idea of helping to save innocent lives! She ran off with a signing sheet, photocopied it, got her subordinates to collect all signatures, and handed me back almost 50 signatures, just like that. Just remember that the Opus Dei is not a religious order, because its members are ordinary laypersons who participate in the secular life of their country to imbue it with the Gospel, whereas nuns have vows of chastity, poverty and obedience, and are therefore not fully human (or Canadian) because of that. I was very proud the day I officially became a candidate. "Now, the journalists are going to swarm me! ", I thought. Zoom out as the apprentice-candidate trips over his shoelace and clobbers his head on the door frame. To begin with, the Elections Canada web site does have the official list of candidates, but they only provide the name and a phone number. I ended up putting a proper list of candidates on my own web site, with pictures, party logos, phone numbers, addresses and web sites. The worst part is Elections Canada has all that information already, since we must provide it to them (except the picture, but that wouldn't be difficult to add). All that information is typed in by some obscure clerk in Ottawa, but the connection is not made with their own web site. Restaurant scene, where the waitress refuses to give the menu to Mr. Bean, while insisting that he orders his meal. If I were the Prime Minister, the Elections Canada web site would provide all that information. Moreover, all reminders and documents sent out (expensively) to each voter in the riding would also say: "Voting is very good, but not enough! You have to carefully study all platforms and candidates, in order to select the best one for the Common good. 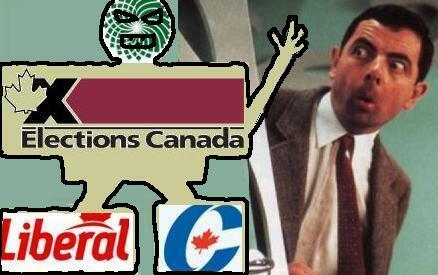 And by the way, you'll find that information here on the Elections Canada web site." Also, voting would commence only after the "Meet the Press" event, organized by Elections Canada in each riding. This event would give each candidate the opportunity to present himself and his party's platform. Right at that moment, a big campaign SUV, plastered with the face and logo of one of the rich candidates, drives by and sprays a huge wave of slush on Mr. Bean, snapping him out of his ministerial daydream. I did produce what I thought was a nice little non-partisan brochure, with the aforementioned proper list of candidates, along with a few texts like Dirty Dishes and Clean Politics, Aren't All Politicians Rotten? and How should we participate in politics?. No response to the e-mail I sent to all other candidates, inviting them to join in a common effort to fight against voter apathy. Candidate apathy? I sent e-mails to pretty much all newspapers. No reactions, except from two local papers (Michèle Thibeau of the Quebec Chronicle and Telegraph and François Simard of L'Appel). Other newspapers did eventually cover the race, but only two journalists managed to spell my name right. Can you guess which two? I tried calling radio stations. The CBC wouldn't give me the time of day. "But, don't my tax dollars pay your bills? Shouldn't the CBC help improve our democracy?" No. "But if the Christian Heritage Party started a riot, then the CBC would cover that event?" Yes. Hum, I'm not in favor of burning Korans and whipping women who are unprudishly dressed, but maybe I should have asked her: "Are you currently wearing a mini-skirt?" Eventually, Mr. Yves Houde from Radio-Galilée (a local non-public sector radio station) did contact me for a nice 12-minute interview. Zoom in on horrified face of Mr. Bean watching his tax dollars burn. I soon realized that my theoretical allies were my practical enemies. In theory, almost all French-Canadians are Catholic, and the official teachings of the Church are unequivocally pro-life and pro-family. Not only that, but the Pope recently reiterated that all Catholics must participate in the democratic life of their country, and that voting for a pro-abortion politician was a serious No-No. There is only one problem: In the Province of Quebec, "Catholic" means "Liberal Protestant". Breakfast scene with Mr. Bean opening a huge and brand-new box of "Catholic Cereals", but when he tries to pour some into his bowl, he only gets a bit of dust. Angry growling noises by Mr. Bean. No media attention. No money to buy air time or newspaper ad space. No help from the biggest Church. Mr. Bean frowns, then suddenly a big smile lights up his face: The Shopping Malls! Three of them, huge, smack in the middle of the riding, right in front of the biggest hospital in Quebec City, and right next to the University. A substantial percentage of the population must pass through those malls on any given day! I visited all three Mall Administrations, with my proposal for a non-partisan Education Center for voters (basically, just a small table in the corridor where all parties would place stacks of their leaflets and platforms, and where candidates could meet the voters). No, in a religious temple for Materialism, we don't tolerate profane activities like worrying about our country. Scene at the entrance of shopping mall, with security guards throwing out hobos, beggars, and politicians. So I was going to have to stand outside to hand out my fliers. I'll always remember the next day, the rainiest Wednesday in the history of Januaries. I walked all the way to the shopping malls, with my right knee hurting, my feet soaked and my fliers in my backpack. I got there, begged God to forgive me, then turned around and went home. In an unrelated department of my life, the only woman who, so far, I would have dared to marry, dumped me the following day. I did crawl out of my apartment after a few days to go vote. Scene with a dazed Mr. Bean walking in slow motion through the crowd at the polling station, with no sound except Piano Concerto No. 21 in C major, K.467 by Wolfgang Amadeus Mozart. Mr. Bean is in another Universe. Nobody sees him. On our final trip to Election Canada's offices, my Official Agent asked the Returning Officer what to do with a campaign surplus. He had no idea. "They always end up in the red", he said. My Official Agent had to call Elections Canada and get bounced around for about 10 minutes before getting the answer (cut a cheque to your political party or to your Riding Association). During this time, I chatted with the Returning Officer and his Assistant. For some reason, the discussion turned to abortion. Both insisted they were Catholics in good standing, and both insisted abortion was perfectly fine, using the standard argument about the 13 year-old raped girl. The Returning Officer even spewed forth with amazing loquacity just about every anti-Catholic slander in the recipe. I admit I missed a good opportunity to be charitable, because I told the Assistant: "Look into my eyes, and tell me if you can figure out whether I'm an unwanted pregnancy or not. Is my legal mother the same as my biological mother, or was my real Mom raped when she was 13?" I'm 6 feet 2 and 235 pounds, and my tone of voice can get pretty hostile, pretty quickly. The Assistant suddenly remembered he had things to do elsewhere. Basically, the mainstream media is against you, the clergy of the Catholic Church is against you (or terrorized into silence), the education system is against you, the Government is against you, the majority of the population is against you, and time and money are against you. Sounds like my kind of challenge!